I finally found an excuse to write about our South Island adventure last year. Basically, my family recently went on a road trip to the Northern Philippines and I would be lying if I say that I am not jealous. How I wish I was there to experience the scary zig-zag road going up to Sagada with them, but hey, such is life. So instead of feeling jealous (and home-sick) yet again, I went through our New Zealand photos and realised that I have not written about our incredible journey from Wellington to Queenstown. This is one of the best things that we did in New Zealand. I intend to go back in the future because we missed a great deal of other beautiful and exciting things in the South Island. Five days was definitely not enough. - From Wellington, we took the ferry to Picton, then hired a car from Apex Car Rentals. The drive from Picton to Blenheim was pleasantly short. Blenheim is a town in wine-growing Marlborough region. We passed by vineyards and wineries but we were not so interested, so we continued driving along State Highway (SH)1 to Seddon. Few miles from the main town of Seddon is Lake Grassmere, a lake used for salt-production and apparently, the lake turns into pink in the summer. It was nice to see it from afar, but I don't think it would have been worth a detour. The excitement finally came when we hit a small town called Ward towards the pacific coast. It was a very pleasant coastal drive to Kaikoura. Kaikoura is known for whale-watching but we were not in the South Island for that, so we only stopped in Kaikoura for a cup of coffee then headed towards Hanmer Springs where we stayed the night. Hanmer Springs is a beautiful sleepy town. It was quite relaxing just being there. They have hot springs which we considered trying, but we were too tired to even do anything. By this time, we would have been travelling for more or less than 8 hours (ferry + drive). - Beautiful, clean and quiet - I didn't expect that from a motel as I've never stayed in one before. - The road from Hanmer Springs to Christchurch led us to some amazing sceneries. Suddenly, we were surrounded by green fields, vineyards, hills and snow-capped mountains. Even the grey clouds couldn't hide the beauty of the countryside. We arrived in Christchurch around midday on a Tuesday. The South Island's largest city seemed quiet. It was evident that the city was still recovering from the 2011 earthquake. The Roman Catholic of Christchurch was the only establishment in Christchurch that we visited. I regrettably suggested going up to Port Hills for a panoramic view of Christchurch. The road was rather scary- narrow, winding and unpaved in some parts. I wanted to go back as soon as I felt that we were going up, but the ever calm J reassured me that he would drive slowly and carefully, which he did. Luckily, there was an alternative route to go down, towards Diamond Harbour. From there, we drove to Ashburton. It was a very pleasant experience to drive over the longest road bridge in New Zealand - the Rakaia Bridge. It was also reassuring that the roads were mostly flat. 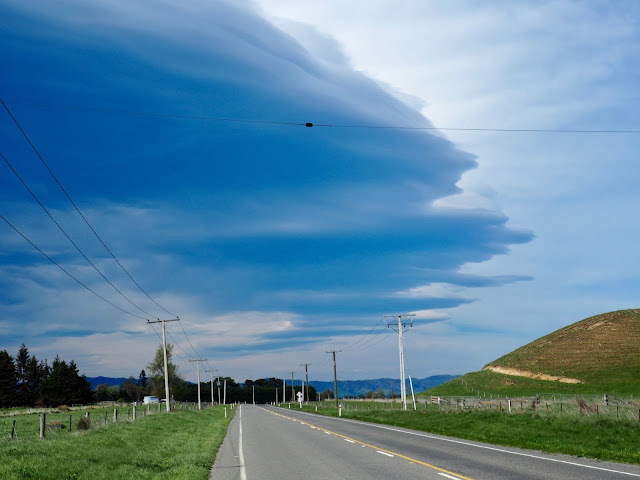 Another reason why I wanted to take this route was so I could eat salmon in the salmon capital of New Zealand - Rakaia. I chose Salmon Tales Cafe as it seemed like it was the only restaurant rated on Tripadvisor. I was rather disappointed that they only served salmon sandwich. So we headed to Ashburton instead and had dinner at Robbie's Bar and Bristo- again. At least I had salmon there. Haha. We arrived quite early in Ashburton so I asked J if we could drive to Mount Somers because I wanted to see Edoras from the LOTR (Mt Sunday). Mount Somers is a small town 40 minutes drive away from Ashburton, situated on the foot of the Alps. The very scenic route led us to what it seemed like an endless gravel road. We retreated in the end and drove back to our hotel. - The room was spacious and had a view of the park. Everything was spotless. It completely changed my view on motor lodges. - Our journey in the South Island became more and more exciting after we left Ashburton. 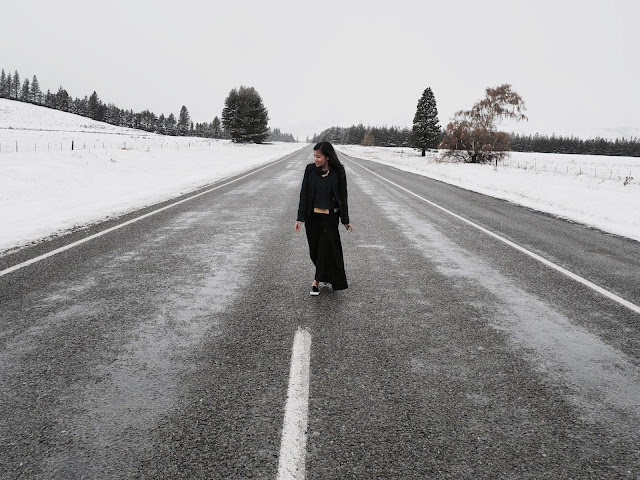 The drive from Ashburton to a pretty town called Geraldine was flat and straight. As we came out of Geraldine, we were greeted by scenic valleys, rolling hills and mountains. We drove through long and winding roads to the top of the hill, only to descend again until we reached the attractive town of Fairlie. After 20 minutes, I could feel that we have reached a high altitude as we entered Burkes Pass. I watched as the green scenery slowly changed into snow covered fields. I knew then that we have finally reached the High Country (Mackenzie Country). Along Burkes Pass is a quaint store called Three Creeks. This is a must stop. They have unique and beautiful products. From Three Creeks we drove further on and it wasn't long until we saw the amazing blue lake (Lake Tekapo). Unfortunately, it was dark and snowing when we got to the lake. I thought we would not be able to see the real beauty of Lake Tekapo. But a simple mistake gave us the opportunity to experience one of the most exquisite things I have ever seen in my life. Basically, I wanted to see Mt Cook (Aoraki)- the tallest mountain in New Zealand, but we didn't have much time. So I asked J if we could at least go to Peter's Lookout to have a glimpse of the mountain. And so we drove 40 minutes via SH 8 to Peter's lookout and came across another amazing blue lake - Lake Pukaki. It was such a beautiful sight. Sadly, the clouds were quite low at that time so we didn't see much of Mt Cook. Then it was time to have lunch after more than three hours of driving. The mistake came when I thought that the restaurant I wanted to eat at was towards Wanaka. However, the road led us back to Lake Tekapo. By this time, the sun was out, and we were able to see the most beautiful turquoise lake ever. On top of that, the snow-capped mountains that shone like diamonds, and the Church of Good Shepherd that was beautiful from afar as it was up close. This absolutely made my day! After about a hundred photographs of Lake Tekapo between us, we left and drove to Wanaka. The road was flat for about an hour and 20 minutes and then suddenly, a rather impressive mountain range appeared before us. It was hard to differentiate the road from the mountains at first because we couldn't almost see the road ahead. But that, I suppose is the beauty of Lindis Pass. We drove between mountains that looked like chocolates, sprinkled with some icing sugar. It was indeed a very dramatic drive through Lindis Pass. I would love to do this again in the future. 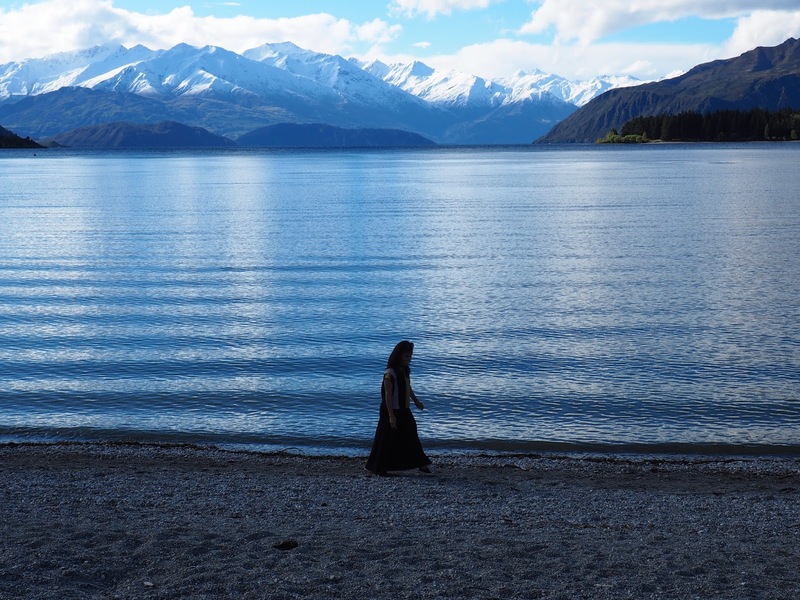 With so much joy and excitement in our hearts, we drove for another hour to Wanaka. We missed the sunset unfortunately, but the following day made up for it- big time. Well, I will have to write about that incredible experience separately. - You pay for the food, the service and the view. - One of the best hotels I've ever stayed at. Everything was almost perfect. - Before we left Wanaka, we dropped by Puzzling World which was quite fun. Their optical illusion rooms were very interesting. But the highlight of our visit was the maze. We were confident that between us, we would be able to get out sooner than we thought but we were so wrong. As we didn't have extra time to spare, we cheated. Shhhh. Hehe. It was a good experience all in all and I would recommend this to anyone visiting Wanaka. Somehow I wasn't anticipating our drive to Queenstown because I knew that we were going to pass through the Crown Range, apparently the highest main road in New Zealand. And boy, was I not scared!? The steep, winding road was ridiculous. It felt like a never ending zigzag BUT, it's definitely one of the best driving routes that we've taken on our journey. As much as I was very scared, I just wouldn't miss the stunning views. I kept my eyes wide open until we reached the Crown Range Summit at 3,530 ft. It was such an incredible view. Simply breathtaking! On our way down, we made a few more stops to take photos of the spectacular views. J definitely enjoyed the rather challenging drive. When we reached Queenstown, it was quite early to check in so we decided to drive to Arrowtown Village, and man, I fell in love with it at first sight. It's a charming little town with tree-lined streets- just my kind of town. The people were very friendly (as most, if not all Kiwis are). Driving around the little town was quite tricky for us. We missed the sign and drove on to the wrong side of the road. But instead of giving us the "such a stupid" look, or worse the "finger", the locals found it amusing and kindly told us that we were driving the wrong way. Then they laughed with us in the end. That made me love the place even more. After our delicious brunch in Arrowtown, we headed back to Queenstown. But J was definitely in for some more driving so we went straight to another town called Glenorchy. I did my research on our way and found out that some of the LOTR scenes were shot in Glenorchy. I am not a LOTR fan as such but I was excited just the same. We decided to drive to Paradise. The drive to Paradise was initially pretty straight with some rolling hills. Within a few miles, we started going up the mountains which was not too bad after our Crown Range experience. The view was consistent with spectacular snow-capped mountains and beautiful lakes (and river). And so we drove hoping to get to Paradise soon, but the road was proving to be never-ending, and the paved road that we were travelling on suddenly changed into gravel. It didn't help that it became so misty. To say the least, we were not prepared for that kind of adventure especially after seeing a car turned over on the side of the road, so we made the best decision to go back and drove towards Dart River Bridge instead, where we had a glimpse of Isengard. - To be honest, we didn't really explore main Queenstown properly which is why I won't be able to say much about it. I suppose because our ultimate destination was really Milford Sound, which I will blog separately soon. We just made Queenstown as our base. Nevertheless, despite being touristy, Queenstown is Queenstown- so beautiful and lively. It took me more than a week to write about this trip to the South Island because in between, I stopped and reminisced the whole experience. One thing is for sure, I wish I'd never left New Zealand despite the earthquakes and the random blustery winds in Wellington all year long. I've never lived in a country as beautiful, peaceful and life-changing as New Zealand. I definitely left my heart in that country down under.